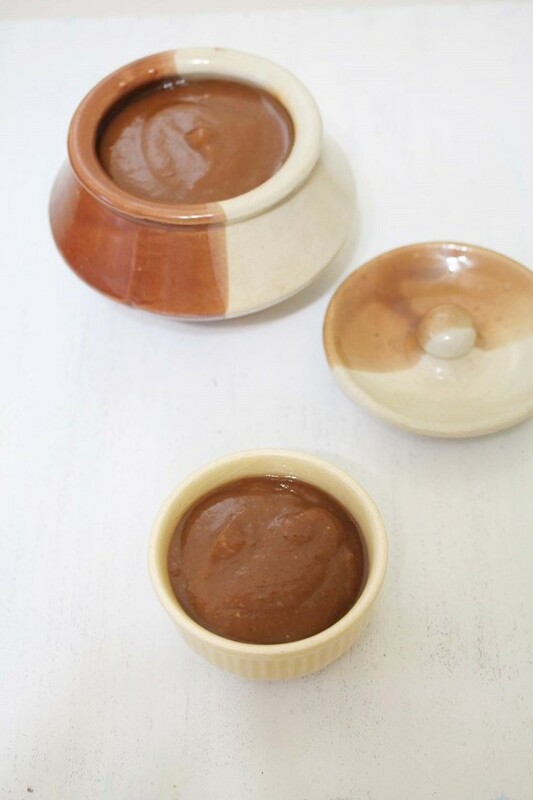 Tamarind date chutney recipe – It is made from seedless tamarind, dates and jaggery. The taste of it is sweet and tangy. It is also known as Meethi chutney or Sweet chutney. In Hindi, it is called Khajur-imli ki chutney. It has khatta-meetha taste. It is one of the must have three chutneys for chaat recipes. 1) Take seedless tamarind and dates in saucepan or patila. 2) Add 3 cups of water and turn the heat on medium. 3) Let it come to a boil and simmer for 7-8 minutes. 5) Also add salt, red chili powder, roasted cumin powder and dry ginger powder. 6) Mix well and let it simmer for again 7-8 minutes. 7) Let the mixture cool down a bit and then grind into smooth paste using blender or grinder. 8) Strain the chutney using strainer. 9) You cannot skip this step, as you can see that it may have some string of tamarind which is unpleasant to bite into. 10) Sweet chutney is ready, let it cool completely before storing in the jar. Making meethi chutney at home it easy and hygienic. Of Course it will taste much better than store bought one which might have preservatives in it. So make this in your kitchen and let me know how you like it. This recipe will make very thick chutney. So for bhel or sev puri or papdi chaat like chaat recipes or whenever you need to drizzle the chutney, you need thinner and runny consistency. For that you can add some water and make it thin as per your requirement. Add water to the only portion that you need. Don’t add water to whole batch otherwise it decreases the shelf life of chutney. Shelf life: Once cool down completely, store in airtight jar in refrigerator for 1 month. It stays good for many months in freezer. The best method to freeze chutney: pour into ice cube trays and keep in freezer till it gets frozen. Then remove the cubes and put them in ziplock bag or airtight container and keep in freezer. Defrost the cubes as needed. It is always good idea to freeze them in smaller portion so you don’t have to defrost the whole big batch which take longer time to defrost. 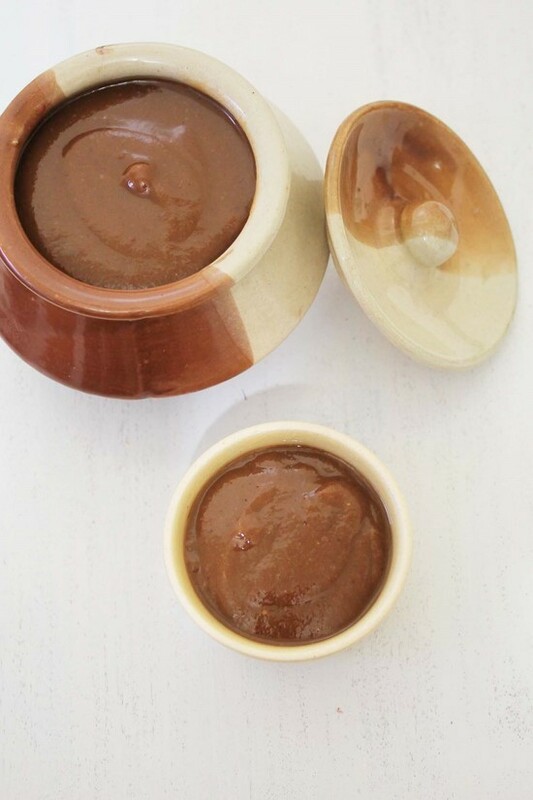 This way you will save some time and won’t decrease the shelf life of chutney. Serving suggestion: This sweet chutney recipe is mainly used in chaat or street food recipes like kachori, ragda pattice, dahi vada, bhel puri, aloo tikki chole and list will go on. This can be served as dipping sauce for fried food like samosa, pakora, aloo bhajji, aloo tikki. Take seedless tamarind and dates in saucepan or patila. Add 3 cups of water and turn the heat on medium. Let it come to a boil and simmer for 7-8 minutes. Also add salt, red chili powder, roasted cumin powder and dry ginger powder. Mix well and let it simmer for again 7-8 minutes. Let the mixture cool down a bit and then grind into smooth paste using blender or grinder. Strain the chutney using strainer. Sweet chutney is ready, let it cool completely before storing in the jar. Any replacement for dry ginger powder? I tried to freeze it in ice cube trays (its been at least 15 hours), but its still a little soft. I’m not able to take it out without messing it up. Does it need longer to freeze? I froze green chutney and was able to remove it and bag it very easily (in half the time). Any advice is appreciated. if the chutney is too thick then it may not freeze well. We need some water content in order to get it freeze. Try adding little water to make runny consistency and then freeze.